I have been making my own body wash for about a year now. Completely homemade and I couldn’t be happier with the result. My husband also uses it and loves it too! Previously I had been using Kiss My Face olive oil soap. It’s really nice and pure and worked for awhile but after I gave birth to my last baby my skin changed and became really dry. Suddenly the olive soap wasn’t cutting it anymore. I knew from past experience that plain liquid castille soap would also be too drying. I needed a little more oomph. I started searching around for a homemade body wash recipe that would be really moisturizing. There are dozens of options out there. I knew I wanted something simple that I could make with ingredients I already have on hand or could be easily (and cheaply) acquired. The process also had to be simple. Mixing was all I wanted to do. When I first read this recipe for homemade body wash on DIY Natural, I thought “there’s no way that will work.” Honey is one of the ingredients and I thought for sure it would wind up as a sticky mess. But honey is something I already have on hand plus I heard it’s a great moisturizer. I was intrigued and decided to give it a try. And I’m so glad I did! The honey gives this body wash a silky texture. It’s not sticky at all. A couple additional oils also provide moisture and the castile soap makes it nice and foamy. The optional essential oils give it a nice fragrance. It really is perfect. To make this body wash I mix the soap and the honey in a liquid measuring cup with a spout until completely combined. Then I add the additional oils and stir gently. Then I pour it into my bottle (pictured above) and add the essential oils last, directly in the bottle. The bottle is just a reused 16oz Castile soap bottle. I’ve reused it so many times that the label rubbed off. I could’ve bought a prettier bottle but I prefer to reuse when I can. A double batch of this body wash fits perfectly in that 16oz bottle. Since Benzo and I both use it I almost always make a double batch. A double batch will last approximately 6-8 weeks with two adults showering daily. The ingredients will separate so you have to give the bottle a good shake before each use. I’ve tried a few different scents in the past year. I really enjoy the geranium and lavender combination that DIY Natural recommends. Lately I’ve made it with sweet orange which was nice in the winter. I also tried a peppermint and cinnamon blend which I did not care for at all. Thinking back I’m not sure why I thought that would be a good idea! Whenever I’m trying a new scent or ingredient I start with a single batch. I recently bought a different brand of honey and while it tastes fine, it gave my body wash a bit different smell. I’ll be going back to my regular honey next time. I used to use this body wash with the geranium-lavender blend on my face for awhile too! That is until I started making my own foaming face wash. Post coming soon…. 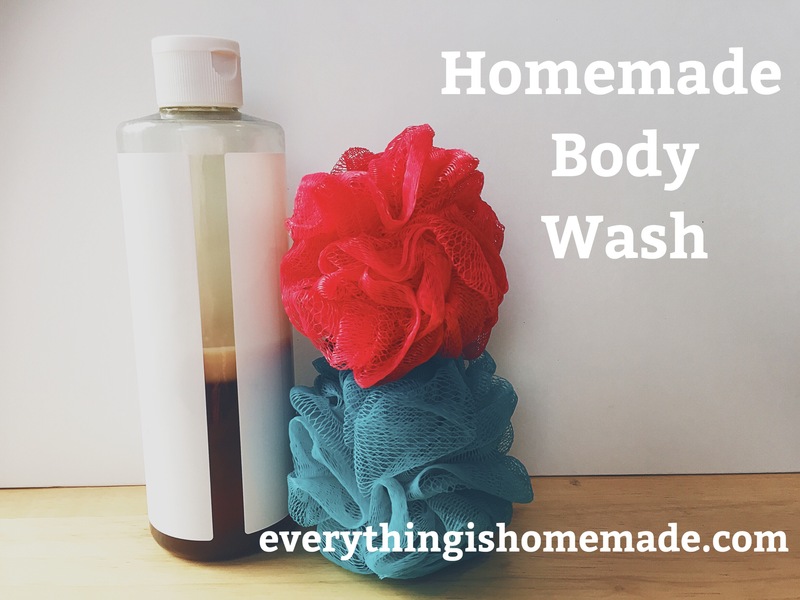 I hope this will inspire you to try to make your own homemade body wash. I honestly love it and see no reason to ever go back to store bought again. There are so many different variations out there, so use this as a starting off point and then tailor it to your likes and needs. I would love any essential oil recommendations for different scents! did you have any problems with clogging pores and creating acne? Can you use this on sensitive skin? Hi Kayla! I have not had any problems with clogged pores and acne personally from using my homemade body wash, however everyone’s skin is different. My skin is generally not too sensitive. I would recommend making a half batch and leaving out the essential oils the first time. Then you can see how your skin reacts and try adding in one essential oil at a time after that. Let me know if you try it!